As a witch, I see crows all the time – they follow me on my path. Oddly enough, I feel safe when I hear them outside my window and I feel protected and watched over. I lived across the road from a graveyard as a child, and I loved to spend hours sitting silently among the gravestones listening to the soothing cawing of the many crows that nested and flew about in the trees above the graves. It’s no coincidence that crows like to inhabit graveyards. For me, their message is to connect with the spiritual world more through meditation and to learn to balance and fly between worlds. Crows can cross between the spiritual and material world. They carry souls over to the other side after death. I had a client once relay a beautiful message to me one day of a crow doing just that. After her father’s funeral, she was sitting in his former home sorting his belongings, when she heard commotion in the utility room. The door and window to the utility room were closed, so she was very surprised when she opened the door to see a crow perched before her! She promptly opened the window and let the bird fly out, and as she did, a beautiful feeling of freedom and release came over her as she felt her father’s soul fly. She knew then that the crow had come as a spirit messenger to show her that her father was released into heaven after his death. Mythology is filled with stories of the crow and raven. Both differ in that the raven is bigger and shaggier in appearance. Both are associated with the visible and invisible, and because of their intelligence, were sometimes regarded as tricksters. In ancient Greece, the crow was a symbol of Apollo and was considered prophetic, depending on the direction of their flight. If the crow flew in from the east or south, this was considered a good omen. Native Americans regard the raven as a symbol of change or transformation. 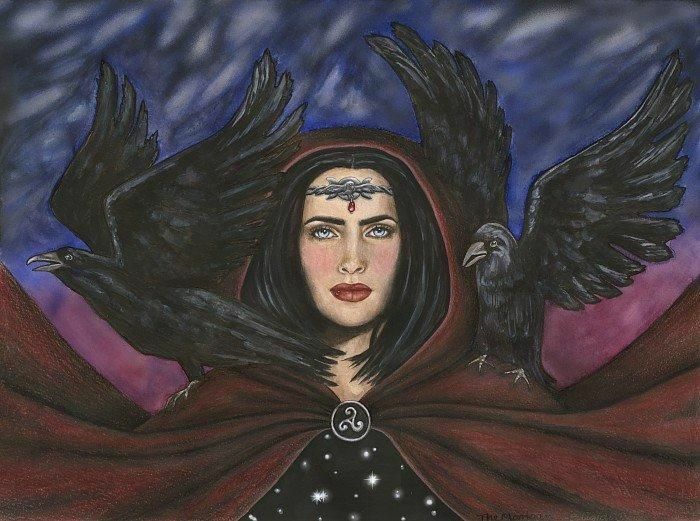 In Celtic mythology, the magical Goddess, the Morrighan, appears in the form of a raven or crow. She is associated with war and sovereignty. Whatever way you interpret it, crows and ravens are symbols of power, mystery and magic. To have a crow as a power animal, familiar or spirit messenger is very powerful indeed. Crows can teach us that there is more to the world than what we see with our physical eyes. The crow is also a harbinger of change and transformation, and will help you navigate change, especially for your spiritual growth. The crow can show us both the light and the dark and bring us into balance and harmony with ourselves. They can help us release the past, let go, heal and fly.